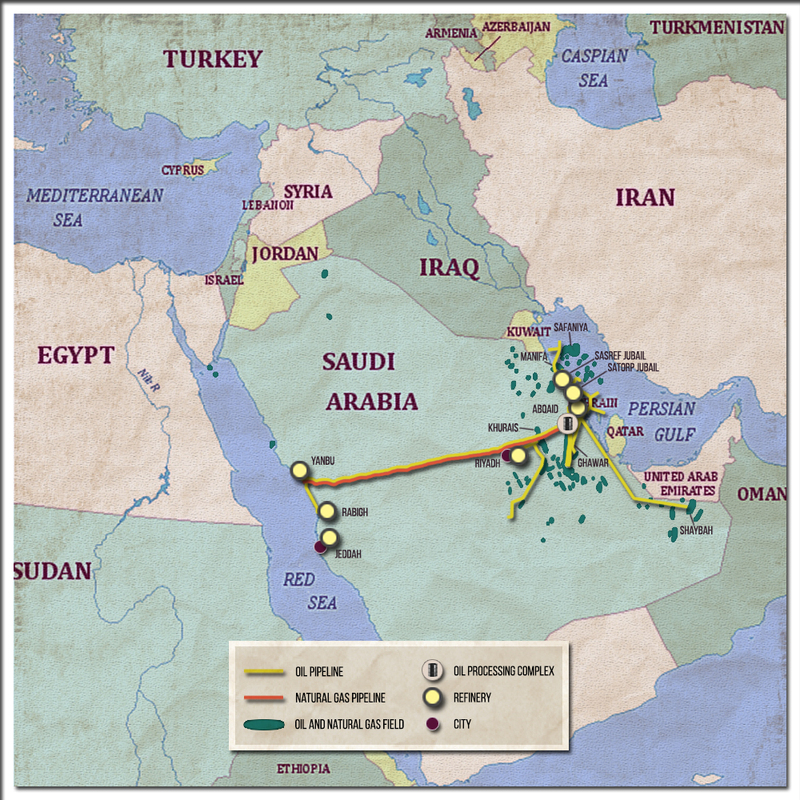 Middle Eastern countries have a more complex and extensive pipeline system than countries in North Africa. Firstly, this region contains greater hydrocarbons. Secondly, many countries there are able to choose between several routes for oil and gas: the Persian Gulf, the Mediterranean Sea, the Red Sea or pipelines to neighboring countries. This article is devoted to the most important existing gas and oil pipelines of the exporting countries, as well as planned projects. Also, we’ll discuss the major transit countries. Saudi Arabia has a pipeline system with a length of more than 17 thousand km. At the same time geographically this system covers a relatively small part of the country. In fact, the main unextended pipeline connects the field to the east of the country to the export port in the same area. Several pipelines Saudi oil output in the western export route – to the ports on the Red Sea, as well as to the north of Iraq. Also, pipelines are stretched to major oil refineries of the country: Ras Tannura, Rabigh, Yanbu, Riyadh and Jeddah. The total capacity of these plants is about 1.6 million bbl. / Day. It’s important to pay more attention to “East-West” route, Transaraviyskom and Iraqi pipelines. The pipeline “East-West» (East-West pipelines) is an important infrastructure project for the transportation of Saudi raw materials from the east of the country to the west. It provides not only access to resources to the other export route – through the Red Sea to Europe, but also transports the raw material to the processing plants in the west of the country, where there are many large settlements and industrial centers. But oil is still the main resource which is needed to generate electricity in Saudi Arabia. The pipeline East-West is about 1170 km. Its capacity is 5 million Bbl. / Day. The operator of the pipeline is the main company of the country – Saudi Aramco. Threads of the pipeline was put into operation in 1984. In parallel with the oil one the gas pipeline is laid, with a capacity of 290 th. barrels of oil equivalent a day. This is the longest pipeline in the kingdom. It is needed to transport the gas to the petrochemical plants in the area of Yanbu. Two other pipelines – Trans-Arabian and Iraq – are not functioning for a long time. 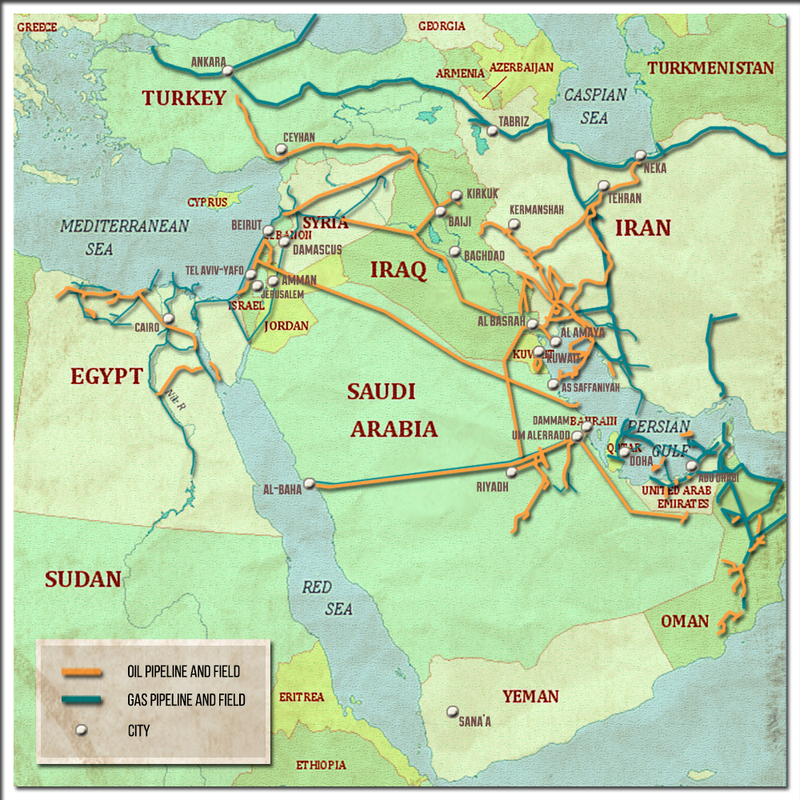 Trans-Arabian Pipeline (Tapline) which joined together allocated in the east KSA Al-Qaisumah and the port of Sidon in Lebanon (by transit through Jordan and the Golan Heights, which were the part of Syria that time). Its capacity is 500 th. barrels. / day, length is about 1,200 kilometers, pipe diameter is 760 mm. The pipeline became operational in 1950, but after 1967, when during the Six Day War, control of the Golan Heights turned to Israel , the object was constantly being attacked. As a result, by 1976 the land to the north of Jordan was incapacitated. Fully the pipeline ceased to function in 1990 after the outbreak of war in Kuwait (Jordan has not sided with Kuwait and Saudi Arabia). Since then, periodically there have been reports of a possible restoration and reconstruction of the pipeline, mostly they come from Jordan, which is aimed to meet the growing demand for energy. Iraqi oil pipeline through Saudi Arabia (Iraq Pipeline through Saudi Arabia – IPSA) also ceased to function due to Saddam Hussein’s invasion of Kuwait in 1990. The pipeline was designed to transport raw materials to the Iraqi Muazzin Saudi port on the Red Sea. The pipeline was put into operation in 1987, then – in 1990. The diameter of the pipes ranges from 1200 mm to 1400 mm. Saudi Arabia has oil (two threads) in Bahrain, to which this country enters the Saudi oil. And in September of this year the country signed an agreement on the construction of the two pipelines. Its length will be 115 km. The value of contracts will reach $ 300 million. The specificity of Iraq is that oil reserves are located mainly in two areas – the north (Kurdistan Region and Kirkuk) and south (field near the ports of the Persian Gulf). The main export routes for Iraq are through the Persian Gulf and Turkish ports. Refineries are located in central Iraq (Baghdad) and near Kirkuk (Baiji refinery). So, the pipes unite Kirkuk, Baghdad and ports in the south, export pipelines are sent to Turkey and Syria. 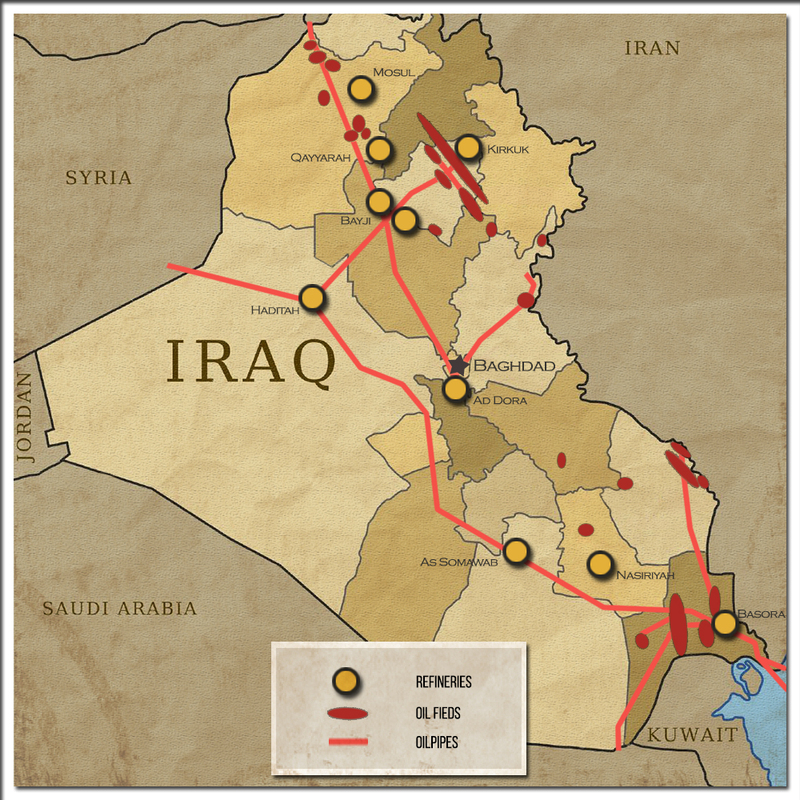 The main national strategic of oil pipeline is a pipeline from the Kirkuk fields to the Persian Gulf. 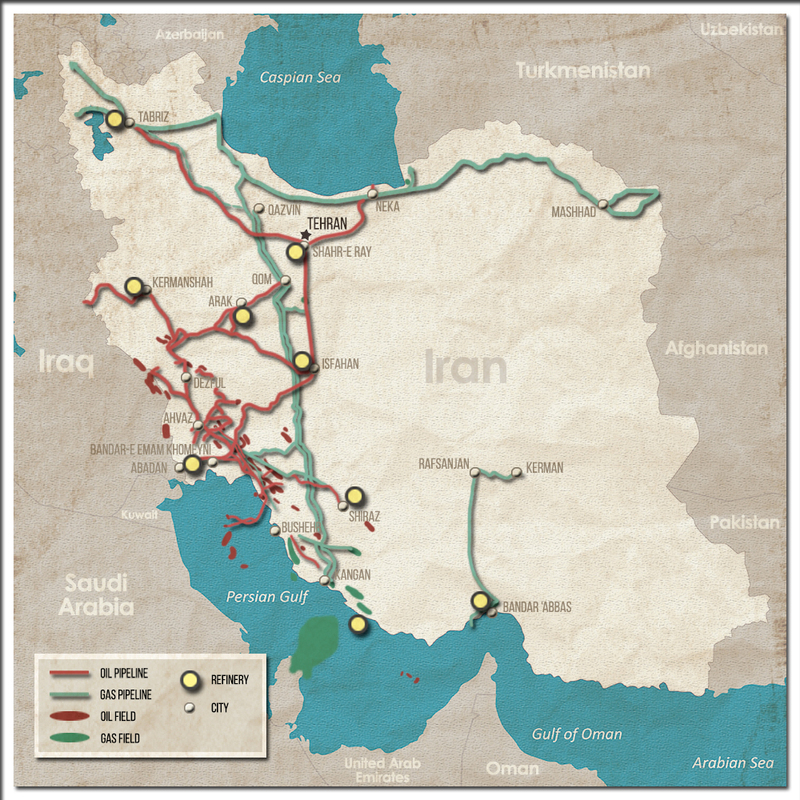 The pipeline passes through the capital of the country and can be operated in reverse direction, delivering raw materials from the southern fields near the Persian Gulf to Baghdad. The most interesting situation has already happened with the main export pipeline between Iraq and Turkey. There are two pipelines, one is controlled by the central government Iraq; the second one is built by the government of Kurdistan Region. After the commissioning of its own pipeline in May 2014 Erbil began independent supply of energy to Turkey, by passing Baghdad. Since then, Kurdish autonomy has been constantly increasing oil exports in its pipeline . In September 2015 the volume of domestic exports reached 602 th. barrels. / day. In recent years there has constantly been a lot of problems with the export of resources to Turkey. And the main reason is blowing up pipes in the Turkish area. Only in August 2015, exports of Kurdish oil fell by 30% compared to July due to the fact that the pipeline was closed for 9 days. According to the estimates of the Ministry of Natural Resources of the Kurdistan Region,in the period from July to September, the Kurdish autonomy underpaid about $ 500 million because of problems with the Turkish oil pipeline. The pipeline is expected to be extended From Iraq to the port of Baniyas in Syria. Previously, it was used as an additional export route. However, after the beginning of the civil war, and then the onset of ISIL in Iraq, the pipeline is practically not functioning. Particularly interesting is the situation in Iran. It’s not just that Iran will soon enter the world market of hydrocarbons after the lifting of sanctions. Due to the nature of economic geography of the country, the raw material for the domestic market of Iran is transported from south to north-west, where are concentrated the processing power and industry. To save money on logistics Iran prior to the tightening of the sanctions regime actively sought the swap transactions with oil and gas to neighboring countries. So, Iran was getting oil from Azerbaijan, Turkmenistan and Kazakhstan, and used it for the needs of the northern regions. Then he shipped its oil from the southern ports for the performance of its export obligations of its neighbors. Currently under construction is the Iran-Pakistan gas pipeline, which can be further extended to China. Construction of the pipeline is planned to be completed in the next 1-2 years. Earlier, there were plans to extend it to India, but due to political disagreements and concerns about the safety ,the project was shelved. At this stage, chinese companies are playing a key role in the construction of the pipeline. The pipe with diameter of 1000 mm will stretch about 900 km. It is planned to supply gas to Pakistan in the amount of 21 million cubic meters. m / day. Other Gulf states have the necessary infrastructure to pump oil and gas to export LNG ports and terminals. As one of the interesting projects in this area, only previously mentioned new pipeline of oil from Saudi Arabia to Bahrain, can be described, as well as the pipeline project Iran-Oman. At the end of August. , the two countries signed an agreement on construction of a 400-kilometer gas pipeline through which Oman will buy from the Islamic Republic of gas in the volume of 28 million cubic meters. m / day for 15 years. The main difference of pipeline in Yemen is that its system is completely isolated from the other countries in the region. Totally there are three pipelines from the central part of the country to the southern and western ports of Al-Shihri, Bir Ali and Ras Issa respectively. There is also a pipeline that delivers raw materials to the Balhaf LNG terminal, which is located in the south-east of the country. At the moment, due to the complex military-political situation in the country, almost no lines are not operating. Over the years there have been rumors about the construction of an oil pipeline between Saudi Arabia and Yemen. However, the plans have not been implemented yet. Egypt is a minor raw material supplier to the world markets compared to its neighbors from the Gulf Stream (produces an average of 700 thousand. Bbl. / Day). Nevertheless, infrastructure for transportation of oil and gas is developed in the country. Pipelines connect hydrocarbon deposits with factories for processing and export multiple ports in the Mediterranean and Red seas. 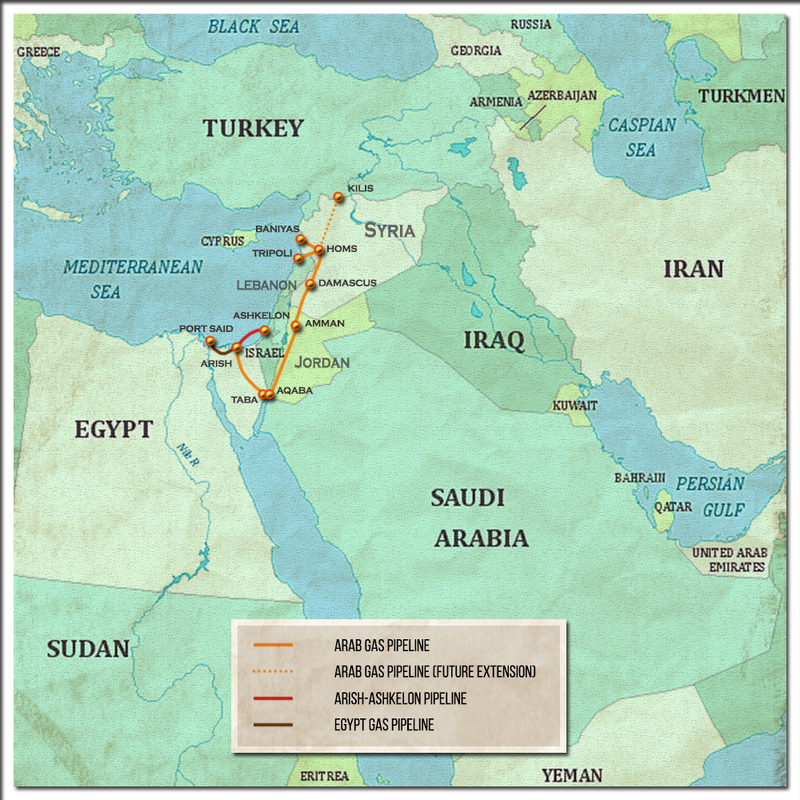 As for interstate pipelines, Egypt is linked to Jordan, Syria, Lebanon and Israel through a single export pipeline – Arab Pipeline. The relationships between Egypt and EU are not so developed in oil and gas sphere. Firstly, nearly impossible to construct pipelines to Greece or Turkey because of the deep-water of the Mediterranean Sea. Secondly, in recent years there was no need for such projects, as the Egypt’s ability to export has severely reduced. Egypt for a long time has been consuming more oil than it produces. And the gas consumption grows very quickly, although Egypt is still able to export the “blue fuel”, which he does in the form of LNG trade. Arab pipeline runs from Al Arish – Taba – Aqaba – Amman – Damascus – Homs, to Israel the pipeline is stretched under water from Al-Arish. The Egyptian section of the pipe almost ceased to function after the fall of Mubarak’s government. With the start of the Arab spring it is constantly under attack. The most serious damage was caused by explosions of pipeline in July 2011, December 2013 and January 2014. Total number of explosions is estimated in dozens. Despite this, in March 2015, mass media reported that the “individuals” from Egypt signed with Israel gas supply contract. It will stretch from “Tamar” in Egypt and it’s worth will be about $ 1.2 billion. The gas was to be exported by Arab Gas Pipeline. Its capacity is 7 billion cubic meters. m / year. In general, the situation with the gas infrastructure in the Eastern Mediterranean is now extremely interesting. There is the prospect of connection pipes in Egypt, Israel and Cyprus. Moreover, Egypt in this case will act as importer of energy resources. Discovered relatively recently and not reclaimed gas reserves in Cyprus and Israel forced to talk seriously about the possibility of converting the two states in the gas exporting countries. In the end of August this year a very large gas field – “Az-Zor” was opened in Egypt. Its reserves are estimated at 850 billion cubic meters. “Az-Zor” may make significant changes in the plans of the three countries. For Israel and Cyprus the other possible direction of gas exports and, consequently, the construction of pipelines can be Turkey. But here comes another problem of the Eastern Mediterranean – political and territorial disputes between the two countries. It will be difficult for Israel to agree with its Arab neighbors, Cyprus – with Turkey. In addition, there are disagreements over the maritime borders between Lebanon and Israel, Turkey and Cyprus. A truly unique position in the region, Turkey occupies. It lies on the way of oil and gas transit from major exporting countries. Transit routes from Russia, Turkmenistan, Azerbaijan, Iran, Iraq, Cyprus are ready, under construction or just planned. Turkey can be a gateway to Europe for countries with approximately 70% of oil and gas reserves in the world. Turkey receives hydrocarbons from Russia (gas pipeline “Blue Stream”), Azerbaijan (Baku-Tbilisi-Ceyhan oil pipeline and a parallel South Caucasus gas pipeline Baku-Tbilisi-Erzurum), Iraq (Iraq-Turkey, the Kurdish Kirkuk-Ceyhan) Iran (Tabriz-Ankara pipeline). But the interesting thing here – is planned project. Firstly, now there is the realization of the expansion project “Southern Corridor”, which includes the extension area of the South Caucasus gas pipeline and the construction of the Turkish section – TANAP (Trans-Anatolian Pipeline). The ceremony of laying the foundation of it took place in March 2015, and the first gas will go through it in 2018. 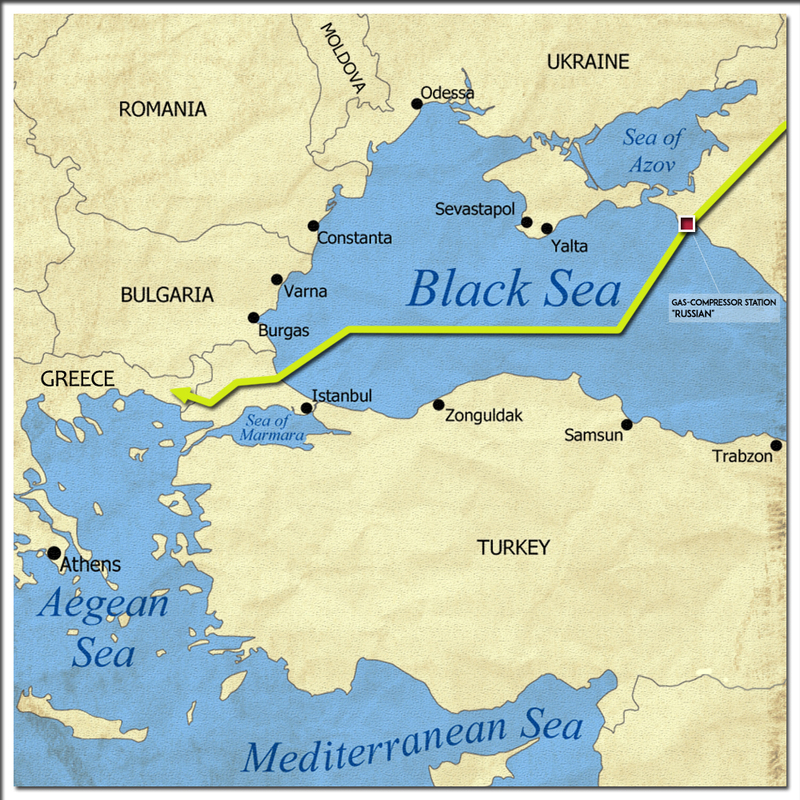 The pipeline will pass to the east of Turkey (from the South Caucasus gas pipeline) to the west. And then it will link with the pipeline TAP (Trans Adriatic Pipeline), which will pass through Greece and Albania to Italy. The planned capacity of TANAP is 16 billion cubic meters. m / year, the TAP – 10-20 billion cubic meters. m / year. The main shareholder in the first project is the Azerbaijan national company SOCAR, in the second one – SOCAR and British BP with Norway’s Statoil. Secondly, of course, it’s important to say about the “Turkish Stream” project, which promotes Russia. 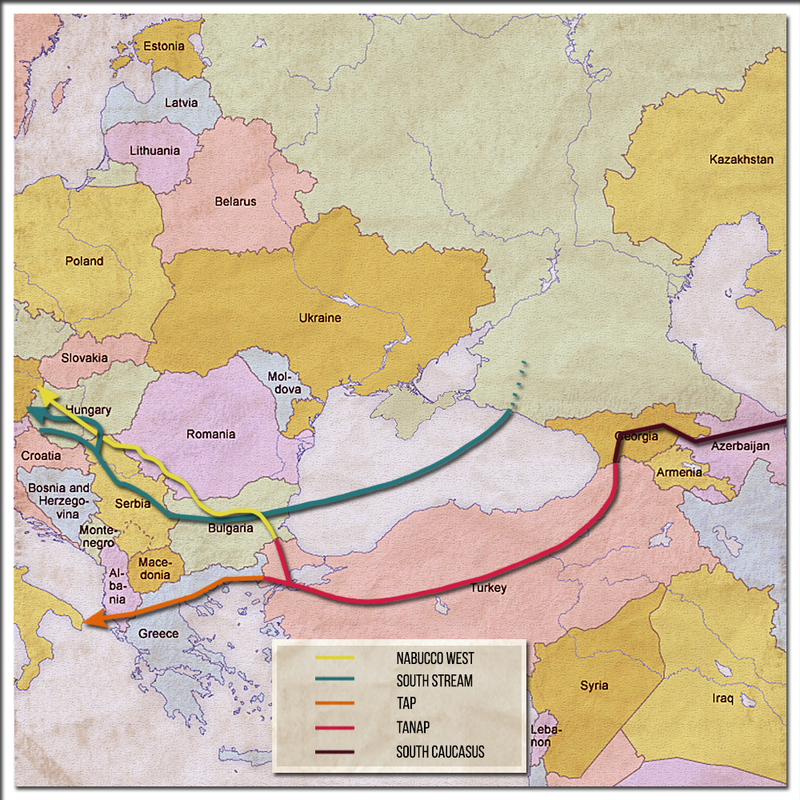 Initially, after the rejection of the construction of the “South Stream”, russian representatives announced that the new Turkish project would include four gas pipeline. The first line will carry the “blue fuel” for Turkey’s domestic use, the other three – for export to Europe. The first string of “Turkish Stream”, according to the representatives of “Gazprom”, will cost $ 4.86 billion. The capacity of each thread should reach 15.75 billion cubic meters. m / year. From the previously planned pipeline through Turkey is necessary to recall Nabucco. It was to stretch from Turkmenistan and Azerbaijan to Turkey, then to European countries (Bulgaria, Romania, Hungary, Austria, Germany). Its capacity should reach about 30 billion cubic meters. m / year. It had been developing till it was closed in 2013. 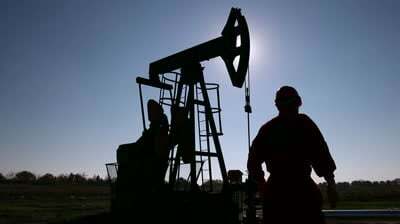 Syria had a relatively well-developed oil and gas infrastructure, in spite of her modest reserves of hydrocarbons. Gas and oil pipelines connects the three main fields of hydrocarbon regions of the country – al-Hasakah, Deir ez-Zor and Homs. In addition, through the Arab Gas Pipeline Syria got Egyptian gas, from there this gas went to Lebanon. Moreover, Syria has received Iraqi oil, which also was sent to Lebanon, and part – to the port of Baniyas. In the past two years, the transit pipelines in the country were not functioning. It’s difficult to say about the current Syrian infrastructure.